Nothing makes for a more confident smile like straight teeth. 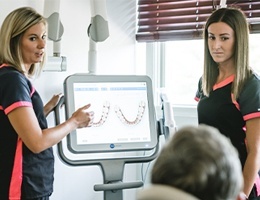 Unfortunately, crooked teeth are a fairly common problem, and even the slightest misalignment can keep you from wanting to express yourself with a big happy smile. Dr. Olsen has good news for those who want a straighter smile, though. Clear aligners allow those with moderate alignment issues to straighten their teeth without the look of traditional orthodontics. In the past, traditional metal braces were the only option for people dealing with misaligned teeth. Anyone who wanted a straighter smile would have to endure a long process and a mouth full of metal wires. Because of modern technology and dental care evolution, we now have invisible braces to help correct crooked and misaligned smiles. 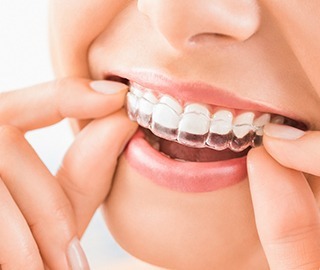 Invisalign® for Ann Arbor residents is an orthodontic system that uses a sequential series of clear plastic braces to address a myriad of bite problems, including overcrowding, crooked teeth, and more. Each pair of aligners is designed to incrementally move you one step closer toward a perfectly aligned smile. With Invisalign®, there are no periodic adjustments to schedule. Dr. Olsen will only need to see you every six to eight weeks to check your progress. Similarly, ClearCorrect™ also uses clear braces as an alternative to traditional metal brackets and wires. These removable braces make eating your favorite foods a breeze—there are no diet restrictions as is usually the case with standard braces. In addition, patients have a much easier time maintaining good oral health during orthodontic treatment with ClearCorrect. Simply take out the trays and brush and floss as usual. During your free consultation with Dr. Olsen, he will decide if Invisalign® or ClearCorrect™ is best for your unique case and determine your approximate length of treatment. While each case is different per patient, treatment typically ranges from approximately six months to a year. As you wear each set of braces, your teeth will begin to shift into place. And because they're virtually invisible, most people won't even notice you are wearing them!